The 3 lead ECG is generally used in pre-hospital care, for continuous monitoring of a patient having had some form of cardiac event. 3 lead is deployed because it is simple to use and requires a much less sensitive machine, and capable of picking up the specific electrical rhythm, or lack of, in the heart. It will do so without too much interference as a 12 lead ECG would. 3 lead ECG is non-diagnostic,thus does not provide a clear view of the entire heart. Instead it provides a basic view of the electrical pathway of the heart triangulated between the 3 leads. 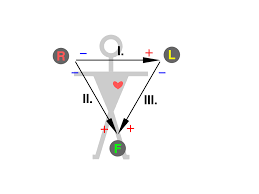 Einthoven’s Triangle is formed when when the three ECG leads are placed on the patient. A yellow lead is placed on left wrist or shoulder- known as AVl. Information gathered between these leads is known as “bipolar”. It is represented on the ECG as 3 “bipolar” leads. information between AVr and AVl is known as lead l.
A CFR would only place leads where directed by the paradmedic and not based on assumptiom.